When my wife and I bought our house nearly eight years ago I was delighted that we found one with a fireplace and for a while both of us enjoyed burning fires during many cold, and even not-so-cold, days throughout the winter months. Once we had kids we kind of got out of the habit because they required a lot more of our attention, and the last few winters here haven’t really been cold enough to warrant a blazing fire. A few days maybe, but the times when we had an opportunity to make a fire never really lined up with days that were cold enough to do so. It was with almost giddy excitement, then, that on a chilly morning in January 2017 after a fresh snowfall which resulted in OSU and all public schools being closed I rushed outside to gather a big load of wood from out back and make a big ol’ fire just like we used to. I started it in the morning and we kept it fed throughout the day, and my boys (ages 5 and 3) were thrilled at the prospect of having the fireplace lit up all day. In what might have been a bit of longing for my own homeland of central Minnesota, my wife and I got out all their snow-based storybooks and huddled up by the fire to read about snowmen, sledding, and a perennial favorite, a hedgehog who ends up wearing a hat. Firstly, what a wonderful and heart warming story. I have tried to take a shot like this many times, with no success. Thank you for pointing me in the right direction on the camera settings. Would you consider these to be a starting point for taking this type of low light picture? That’s a great question, Skip! I’d highly recommend a setup like this if you want to experiment with low light long exposure photography since it is a very controlled environment. You’re indoors with a static subject so you can just play around with manual settings as long as you like. I’d say give it a try! 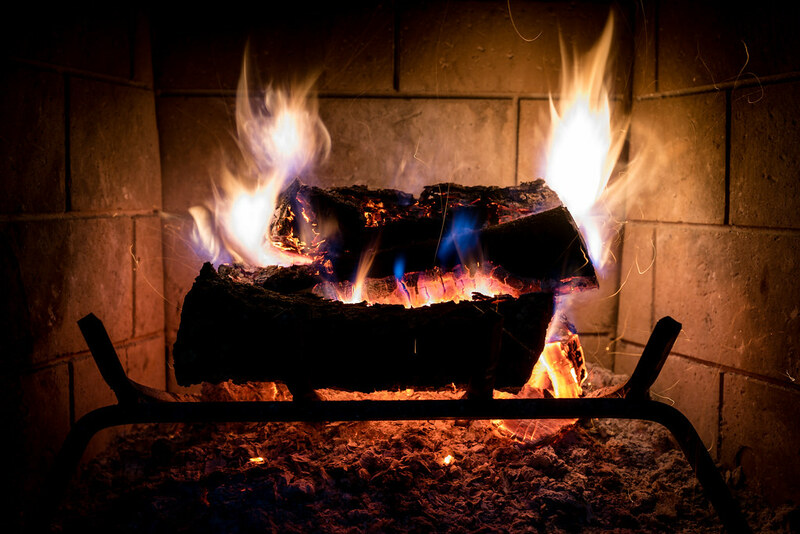 I grew up in Phoenix, Arizona, which had even less of a reason for a fireplace burning, but my parents still would light up the fireplace in our family room when ever it got “chilly.” I remember that warm glow, which your photo illustrates very well. Perhaps, it wasn’t the glowing fire as much as the family time together that made the memory. PS-When I was a child, burning our trash was the only way we had to get rid of it (60 years ago). Always nice to meet a fellow trash burner, Dennis! And to be honest I didn’t know people in Phoenix even had fireplaces. Shows you how much I need to get out more, I guess :) You’re right about that warm glow in that there’s just something about it, even if it’s not exactly super cold outside, that creates such a singular sense of comfort you can’t get any way else. Thanks for your comment, and for teaching me something new too! This is a nice warm photo to open up on a rainy day here in Cincinnati. I can appreciate your memories of fireplaces from your childhood home. Through the cold blizzard years of 1978-79, my father shut off seldom used rooms in our house and we supplemented the heat in our house by burning fires in the more formal living room. A cozy fire brings a special kind of warmth, inside and out. In our current house, it is a winter treat to start a fire and have a “family movie night” with our daughter. Your 10 second exposure gives just the right amount of ambient light to this photo. At that shutter speed, I would expect it to be brighter. Just the right mount of sparks and flame are captured. Isn’t it interesting how we can conjure up images of blizzards from our childhoods, Rebecca? I distinctly remember times when we were shut in our house due to overwhelming snowstorms when I was a kid, and in times like these there was always a roaring fire going just like what you described during 1989-79. I’m picturing your whole family huddled in the living room with heat from the fireplace, and it just makes me feel warm and cozy all over :) Thank you for sharing those special memories! Ah, I don’t know which is best, the photo of the fire or the story that goes along with it.